At Best Friend Fence we are dedicated to providing the safest and most reliable dog fencing products to our consumers. Whether you are a home owner or provide a dog kennel service, we have the right product for you. Our dog kennel fences will keep your dog or pet in a large contained area where they are free to run and play outside. Best of all you will not have to worry about any of the dogs being able to escape or any other animals being able to enter the dog kennel fences. If you are interested in purchasing one of our dog fence kits please make sure to click here to learn more about our products. Dog Kennels, shelters, USPCA facilities, humane societies, animal rescues, pet stores, breeders and many others all rave about the reliability and functionality of our dog kennel fence products. 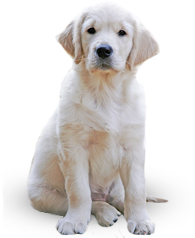 Customers will feel comfortable leaving their dog at your facility and their dogs will be able to exercise and play in a safe, humane environment. Our dog kennel fences are the smart investment for your business. 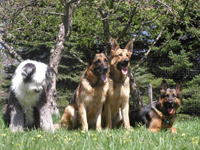 Many dog owners harbor concerns about the safety of their dog when they leave it at a kennel or dog watching facility. Your customers can rest assured that with Best Friend Fence dog kennel fences their pet will be safely contained in a large area and free to play in a safe and humane environment. Our dog kennel fences are not only a great solution for kennels and other businesses, but home owners will also benefit from our dog fence kits and products. The dog kennel fences are even strong enough to keep deer and other animals and critters from entering your property. Unlike other types of wireless dog fences or electric dog fence systems, it will not cause any harm to your dog or other animals that try to enter your property. 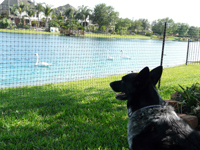 At Best Friend Fence we have the humane and safe way to keep your dog or pets contained. If you have any questions about our dog kennel fences please make sure to contact us and a friendly staff member will assist you. The reason that our product has been rapidly increasing in popularity due to our safe and humane way of keep your dog or pets in a secure area without the use of electric shock. There are many different issues between wireless or underground dog fences compared to our dog kennel fences. Wireless dog fences not only shock your dog if they try to leave an invisible area, but they also do not defend your dog from people or other animals. Electric dog fences also cause shock pain to your dog which is not a humane solution unlike our quality dog kennel fences. Best Friend Fence dog kennel fences enclose your dog safely and effectively without incorporating electric shock or sound wave transmission. If you are ready to purchase our dog kennel fences for your home or business please make sure to visit our dog fence kits for more information. Our goal is to provide you or your business with as much information about our products as possible and if you have any questions or comments then please make sure to contact us. There are many reasons to purchase our dog kennel fences and we have highlighted even more information about our products below. Our dog kennel fences are difficult to see from distances as close as fifteen feet which means it will not take away from the appearance of your home or kennel. The black color of the fence, coupled with the very thin profile creates a "virtually invisible" effect which makes the fence difficult see both during the day and at night. When you order our dog kennel fence you will receive everything you need to create a complete enclosure for your property. Each of our kits includes fencing material, support posts, ground stakes, and zip ties. We also include a detailed and easy to understand set of instructions which will guide you step by step on how to install the dog kennel fence. Additional accessories are also so that you can create a customized enclosure system that meets all of you and your dog's needs. At Best Friend Fence we want the installation to be as simple as possible for you or your business. Please make sure to visit our dog fence accessories page to find other great tools to use with your dog kennel fences. You will rest assured knowing that your dog or pet is safely being contained with our Best Friend Fence dog kennel fences. Our dog kennel fences safely keep your dog in a secure area but it will also defend from any other animals from entering your property. There are many reasons to purchase our dog kennel fences and we invite you to order one today. A Best Friend Fence enclosure gives your dog or pets the ability and freedom to safely play or roam in your yard or kennel. You won't have to worry about the dog being able to escape or other animals being able to enter your property. We look forward to working with you or your business in the near future and if you have any questions please make sure to contact us.